A simulation exercise to investigate and improve Australia’s preparedness to respond to a possible detection of Xylella Fastidiosa was conducted by Plant Health Australia in Brisbane recently. Xylella is an invasive bacterial plant pathogen and is one of the world’s most feared pests. Although it is not present in Australia, it is of major concern to Australian plant industries. 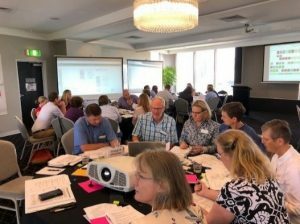 Funded by the nursery industry levy, the two-day exercise brought together 60 key representatives from plant industries, science and academia, as well as government regulatory bodies across Australia and the Commonwealth. The first part of the Xylella workshop looked at key technical information about the pathogen and its vectors, including known hosts and its increasing spread around the world. After discussing the foundations, the workshop focussed on the technical feasibility tool, an excel-based program designed to support decision makers before and/or during a pest incursion. The tool works by combining a significant amount of information, which allows decision makers to identify data gaps and provide guidance on whether it is technically feasible to eradicate a pest. Day two was largely based on an industry response strategy. Together in groups, participants looked at key challenges or situations to take into account when coordinating a possible response. According to NGIA John McDonald, there was robust and constructive discussion between participants over the two days. “There was good engagement from beginning to end. It was pleasing to see the synergies and parallels that exist between different industries,” Mr McDonald said. “The workshop was a great opportunity to bring together science, industry and regulators to strengthen their networks and to increase understanding in the event of an incursion. Plant Health Australia will combine the information collected from the workshop and deliver a short report over the next few months. It will form a guiding document that industry can build upon over time. Feedback from participants was very positive and the exercise by Plant Health Australia was delivered to a high standard. The workshop tested the elements around a response plan – and helped to position growers for the future. « Growers, retailers and landscapers urged to participate in data survey	» Plant Life Balance continues to grow with launch of new looks, blog and first consumer event!